Gérard Schmets is health economist who started his career as researcher in the University of Louvain, analysing the financing of the Belgian health sector. In 1986, he joined the NGO “Médecins Sans Frontières” in Mali for his first of several long term assignment abroad related to strengthening health systems. Subsequently, he pursued a career as a consultant for AEDES, a health consulting firm based in Brussels, for which he became deputy managing director; a position he held until 2004. Since 1986, Gerard has worked intensively on health systems abroad in Africa, the Pacific Islands, the Caribbean’s, Eastern Europe and Asia, on long term and short term missions. He also worked in Europe on hospitals reform and hospitals management as managing director of Gemelli, a Belgian firm specialized in Hospital Management. 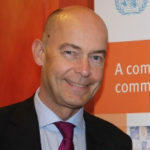 He joined the World Health Organization Regional Office for Europe in 2004, where he was in charge of the Division of Country Health Systems. In April 2008 he became coordinator of the Health Systems Governance, Policies and Aid Effectiveness Unit at WHO Headquarters in Geneva, Switzerland.